Confession: I used to think using a tallit when you pray was weird. It’s true. I did. And it took a dramatic event to change my mind. Awhile ago, something happened that made me feel spiritually uncovered. When this thing happened, I could really feel the absence of that spiritual covering right away. It was horrible. The only way I can describe that feeling is: it felt like I had been tossed out on the interstate highway of spiritual warfare with little-to-no protection from oncoming cars. I felt like I was suddenly on the front lines of battle with no army behind me. I went home, crumpled to the floor of my study, and cried. I had a tallit that a friend had given me. It sat on the shelf and had for a long time, because I always thought using a tallit was weird. But my pastor had always taught us that it represented the covering of God. As I sat on the floor of my study that day, I needed covering. I felt so exposed. So I retrieved that tallit. I put it over my head like it was a shield between me and the world–a shield between me and the battle. And you know what? I could feel it. There was a noticeable difference in how I felt and how much peace I had when I had my tallit over my head, and when I didn’t. A tallit represents covering, and using one brings supernatural manifestation of the Holy Spirit. 1. I use a tallit when I pray to represent God’s covering and His secret place. My God, in Him I will trust” (verses 1-2). His truth shall be your shield and buckler” (verse 4). The secret place of the Most High is that place right in God’s throne room, where you are aware of God and God alone. It’s that place where it’s just you and Abba Father, and it’s where all things are made right again. And somehow, when I cover my head with my tallit, any place becomes the secret place. The tallit blocks out the world and helps me focus in on Him alone. It’s His wing; I can feel His feathers covering me. Placing my tallit over my head when I pray helps me enter quickly into radical encounter with Jesus. 2. I use a tallit to represent my covering over women I mentor. I met recently with a dear friend of mine whom I was going to mentor. It was our first meeting. When we sat down, I felt like the Holy Spirit was telling me to place my tallit over her shoulders. Honestly, I felt very weird doing that, and I told her so. I had no idea why God would tell me to do that, but I was positive it was Him. So I did (and she was ok with it). And after our meeting, I could see why the Lord told me to do that. It was as if placing my tallit over my friend represented my pulling her under my spiritual wing. It represented my covering over her: that I was making a covenant with her to walk with her, love her, pray for her, and impart to her anything holy on my life that God wanted for her life too. The tallit was like my wing, and placing it over her was symbolic of that mentoring relationship we were establishing. It was cool. I would never have thought of it, but the Holy Spirit knew. So since then, both my husband and I have continued using our tallits to represent covering over people we mentor. We’ve let a precious brother we are doing life with use my husband’s tallit when we’re praying together–because it represents our covering and brotherly love over him. It’s been powerful, too. 3. I wrap myself in my tallit when I sleep, and you would not BELIEVE the sleep I get when I do. I started doing this during the traumatic time mentioned above, but it gave me such deep sleep that I kept it up. So every night, I spread my tallit over my pillow, lie down, and then pull the ends of the tallit back over myself. And it’s unreal. I sleep so deeply and soundly when I use my tallit–way more deeply than I sleep any other time. A tallit gets heavier and more anointed with use. I have been through several tallits, because I keep giving mine away. And each time I’ve started over, when I’ve taken the tallit out of the bag, even though it’s been great, it’s felt like a mildly-anointed piece of fabric. But after I have used each tallit a few times, they have gotten “heavier” and heavier with glory. So I want you to be aware of that. If you’ve never prayed with a tallit before, get it out, anoint it with oil, pray over it, dedicate it to the Lord, and then use it. A lot. And the more you do, the more benefits you will reap from its use. Are you intrigued? Are you ready to get yourself a tallit? Get one that you like, but I can tell you that I really like–and have had good experiences with–the acrylic ones made in Israel by Talitnia on Amazon. They come in all price ranges, colors, and several different sizes, so you can pick the one you like. If you’re interested in purchasing one from Amazon, I’ve placed several Amazon links below to tallits I like personally. The long, skinny ones are great for one person. My husband and I purchased one recently for a dear friend who is head of his family. We got him a larger one, because not only can he wrap himself in it, but he can also wrap his wife and child in it at the same time (it’s pretty big). So if you’re the head of your family, you might want a larger one like that. 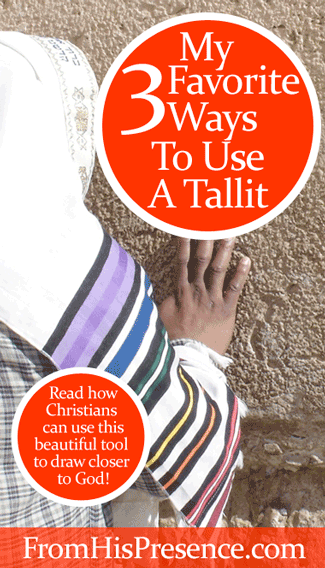 Have you ever used a tallit? If so, what’s your favorite way to use it, and what benefit do you feel when you do? Image courtesy of Yuval Saar on Flickr via Creative Commons license. i too have had a traumatic time a few years ago, and for a while now have felt like im not under a covering it really effects me and going to church just doesnt suffice for it anymore, its like the part of me that allows the covering is not allowing myself to be covered for some reason, anyhow i could go into more detail of my experience with this covering thing but will hold back for now, so i want to know if you want to elaborate what caused you to feel like you were not under a covering? and was the tallit the only thing that fixed it? or did you find another avenue aswell as the tallit to be under cover? I don’t want to go into extremely deep detail here, but I will say that I lost a specific relationship with someone who was a spiritual covering for me. It was horrible and things weren’t totally fixed until that relationship was restored, which it was after awhile. But while I waited, I used the tallit not because IT covered me per se, but because it was a tangible faith-builder that GOD was covering me. It reminded me that God loved me, that He would protect me and take care of me, and that He has all things under control. I’ve talked with several folks lately who feel uncovered, for a number of reasons. Sometimes their leaders aren’t doing their job and leading; sometimes they aren’t in a place with any leaders at all (e.g. they’re not going to church or being active in the Body of Christ); sometimes it’s been because they’ve taken an offense (or grabbed onto somebody else’s offense) against their leadership. I’m sure there could be other reasons too, but those are the ones I’ve seen lately. Of those three, I believe the last one is the most destructive. With the first, they can find new leaders or maybe the person wasn’t in the right place to begin with. Or people can start going to church; those are kind of obvious solutions. But the third one is a veiled trick of the enemy, because when we get offended, it seems justified; but that offense turns into bitterness and unforgiveness against the leaders, and essentially the person rejects the covering that is available to them because they refuse to forgive. I really believe we all have to continually search our hearts about all three of these things, because the enemy would love to pull us outside the safety zone of spiritual covering. Blessings to you, and thank you so much for reading! Hi this is Wendy I have just started and I enjoy your tallit idea continue the good work. Hi Jamie. I came across this post while researching what tallits look like, as I was thinking of making something like it to help me pray for my baby daughter. She’s recently been given a diagnosis of a degenerative genetic disorder, and we are depending totally on God for her life and healing. Id read somewhere that the woman healed of bleeding actually touched the tassels on Jesus’s tallit, and I liked that idea. Anyway I’m so encouraged by reading your experiences, and the thought that a tallit could physically represent God’s covering over me in my heartbreak feels very comforting. Thanks. Hi Amy, that’s awesome. Thank you for sharing. Yes, I’ve heard that too, about the woman with the issue of blood touching the tassels on Jesus’ tallit. I think I heard it from Pastor Ron Phillips. Very cool stuff! I pray Papa God would touch and heal your baby girl. I will join you in praying for her. Heavenly Father, in the name of Jesus, I lift up Amy’s daughter to you. In the name of Jesus, I bind off every sickness and malfunction and infirmity from this girl and I command it to leave right now in Jesus’ name. I command every sickness and every spirit of infirmity to leave this baby girl in Jesus’ name, and I loose healing into her in Jesus’ name. I command strength into her body, soul, and spirit in Jesus’ name. I speak to her genes, and I command them to be restored and healed and line up with the Word of God, which says that this baby is fearfully and wonderfully made. By the stripes of Jesus she is healed, so I speak to her body and I say: Healing from Jesus, manifest right now in Jesus’ name! Goodness of God, be revealed in this baby’s flesh in Jesus’ name! Kingdom of God, come, in Jesus’ name! Will of God, be done on earth as it is in Heaven in Jesus’ name! Baby, be healed, strengthened, and empowered RIGHT NOW in the name of Jesus Christ of Nazareth. In Jesus’ name, let it be done. Thank you for sharing, Amy. I pray you’d have a wonderful day and that our Papa would strengthen you too. He sure is. Praise God. It’s my pleasure and I’m so glad Daddy God is using it. 🙂 Have a wonderful day! Hi, I have been interested in the Towey since before six grade and I have done research about it and I have wanted one on and off for a while, and think it would be good for me to get one, do you know if there is a way to see if a tallit is right for someone. Thanks, do you know if there are others with experience with the tallit. A tallit is a point of contact that builds your faith that you are right smack in the Presence of God. It’s a beautiful piece of our Jewish heritage, because every Christian is one with the Jewish people in Christ. So absolutely if you want one, get one. I would also recommend anything Pastor Ron Phillips and Rabbi Curt Landry have about tallits and our Jewish roots. Hi, thanks, can someone wear a tallit all day or would they have to get a tallit katon? The type of tallit I want to get is a tent size tallit aka a tallit gadol, can you share some experiences with the tallit? I am about 5’1″ or 5 feet and the two sizes I am interested in are 55X75 and 36X72 which size shuld I get, I am also female. Hope, I think you can get any kind of tallit you want. Just my personal opinion. I wouldn’t want to wear it all day personally because I think I would feel weird doing it, and I think it would turn people off too (people who see you doing it). I personally keep mine for private, personal use – or for ministry situations when I am leading a worship service and praying for someone using the tallit etc. Or you can google the shofar man tent tallit, I am wanting to get the gift pack one where the shipping and another tallit and a tape is included with it and the 36 size one is 107.77$ and the 55 size one is 137.77. I have purchased both the long, narrow ones and the wide ones before. I much prefer the largest size, because you can wrap yourself up in it like a blanket. Hello my name is Heather Powell. God lead me to becoming a Mantle maker about 8-10 years ago. I first started making tallits for the people in the Messianic congregation that I was attending. I have made well over 100 tallits and there have been no two alike. I ask people what their favorite verse is, color and giftings. I then approach God and ask what the tallit is too look like. All the people I have made them for have said that it’s exactly what they wanted. I was wondering if there would be any desire for the individualized tallits that I make to be available to you or those who you minister too? I am a stay at home mom of 4 kids. Thanks for taking the time to read and respond to my post. Greetings, Heather! I recently discovered the tallit, love it, and am trying to learn everything I can about it. I would like to get one for my husband but we haven’t found one that suits him. However an individualized tallit like you described piques my interest and may be perfect for him. Do you still make tallit? Wow! I had never heard of head coverings etc. in my life and then it has been everywhere! Thank you for this article. Dearest Jamie, I just saw your email last night and did a double take. February 8th I was awakened by the Holy Spirit admonishing me to pray in tongues and take communion because He wanted to eradicate an evil spell or he. I complied although I didn’t completely understand but knew I am tired of the groundhog day effects of bullying, deception and manipulation st work, general confusion and lethargy where they didn’t exist, and extremes in opposition in my finances, taxes and credit (don’t get me started on betrayal and suicidal ideations!). Thank you, thank you, thank you for yielding to the Holy Spirit, receiving this word and sharing. It is Confirmation of what took place during my prayer time on Feb 8th and a gentle reminder that He not only loves me, but that people care about me whether I recognize it or not. From my heart to your…thank you Miss Jamie!